An adjustment is the term used when a chiropractic doctor uses either a hands on method or a tool/table assisted method of relocating a vertebrae of spine. This is a very safe and gentle process for patients of all ages, genders, shapes and sizes. During an adjustment, often times there is an audible sound which is the release of gas pressure from the joint and joint fluid. Some techniques can be performed in which there is not a “popping” sound during the treatment. The purpose of the adjustment is to help realign the spinal structure in order to take pressure off the nervous system and spinal nerves. Once the spine is moving and positioned well, the body is able to heal and maintain itself through a proper functioning nervous system! Patients that come in to our office will receive first day X-ray imaging if needed to help further diagnose your condition as well as providing extremely valuable information about the health and overall integrity of the spinal structure. The films will be shown to the patient and given a full report on the findings and significance of them. Non-surgical spinal decompression is a treatment that uses a pulling force on the spine to relieve pressure on the discs and vertebrae in either the lumbar or cervical spine regions. It is used to treat a variety of common causes of back or neck pain, such as a herniated lumbar disc, bulging disc, spinal stenosis, degenerated disc, facet syndrome, or sciatica/leg pain. 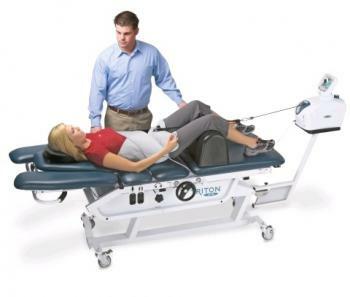 Spinal decompression is delivered with a device that essentially pulls to separate the lower body from the upper body. We use spinal decompression mostly for patients that tried, physical therapy, had epidurals, and previous back surgeries with little results. We also consider spinal decompression when a patient presents us with a recent MRI that confirms herniated discs causing nerve pressure. It works particularly well for patients that suffer with chronic low back pain, sciatica and spinal stenosis. The patients age range varies widely from 20-90 years of age. We do not use spinal decompression when a patient is either pregnant or has a metal implantation in their spine. A good patient age range is between 25 and 55. It is important to manage expectations, as results may not be as immediate as one expects. This is especially true when performing spinal decompression on elderly patients. Muscle stimulation is a wonderful passive therapy that utilizes small painless electrical impulses into the muscle as if the central nervous system was in control. It is very helpful in reducing muscular pain, decreasing damage to muscle fibers, and aid in the rehabilitation of weak/damaged muscles suffered from joint injuries. Typically a session will last anywhere between 8 and 15 minutes. When the spinal structure has lost its normal motion and mechanics, this therapy is used to restore the flexibility and motion to the joints of the spine. The type that we offer can provide more of a “kneeding” motion or a more smooth and softer approach. Manual therapy is used to help promote soft tissue recovery and more specifically muscle trigger point relief. A trigger point is basically a knot that builds up in a muscle due to chronic physical strain whether it is from poor posture, repetitive strain, over utilization, or direct injury. Manual compression is direct pressure on these areas and some may be tender to treat depending on severity and duration of the chronic issue. The direct precise pressure helps to reduce the swelling and lactic acid build up on the injured area. This therapy is wonderful for restoring blood flow and normal elasticity to muscles and help them to recover their normal length. In order for a spinal structure to become strong and healthy, proper SPECIFIC exercises are needed to help strengthen weak muscles, and to lengthen tight/ taught muscles. Exercises and stretches are shown to help target a specific need in order to do normal daily activities with confidence. If a plateau is reached a change in the exercise can be given to keep progressing and help reach a goal. These exercises are very important to help keep the spine strong and helps hold the spinal adjustment between check-ups!